Dressy Bessy is an indie rock band from Denver, Colorado, associated with the Elephant Six Collective. Guitarist John Hill also plays with the Apples in Stereo. Lead vocalist/guitarist Tammy Ealom formed the band with drummer Darren Albert and guitarist turned bassist Rob Greene in 1996. The name was taken from a popular Playskool doll of the 1970s. Hill joined around the time they started recording. They released two singles and an EP in 1997-98 and licensed songs to some compilation albums. 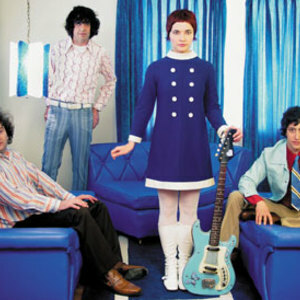 Dressy Bessy's first full-length release, Pink Hearts, Yellow Moons (1999) was a mixture of beat group drums, infectious songs, and the odd burst of harmonium. Further releases include California Ep (2000), Sound Go Round (2002), and 2003's Dressy Bessy, which incorporated a harder guitar sound. 2003 also brought the compilation, Little Music: Singles 1997-2002. These albums were initially released on Kindercore Records of Athens, Georgia. Their songs, If You Should Try To Kiss Her and Just Like Henry were featured in the 1999 film But I'm A Cheerleader. In late 2004, drummer Darren Albert left the band and was replaced in 2005 by Craig Gilbert. Later that year, the band signed to Transdreamer Records and recorded their fourth album, Electrified, which was released in June 2005. The band released their fifth album, Hollerandstomp, on September 16, 2008.